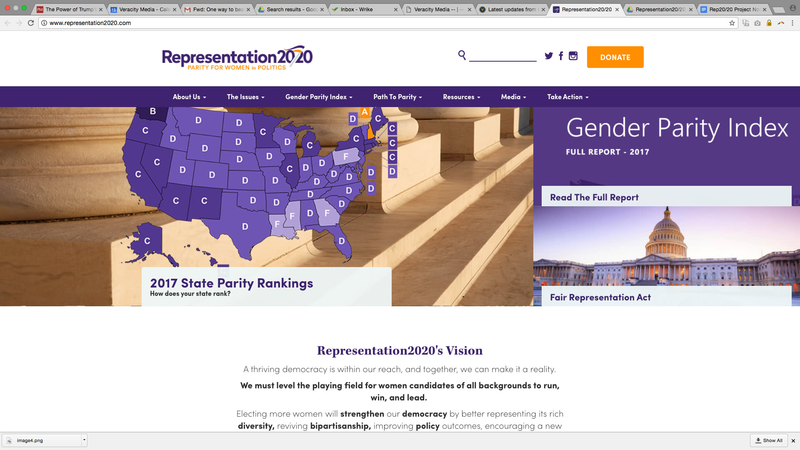 Representation20/20 is a non-profit organization that works to raise awareness of the under-representation of women in elected office, strengthen coalitions that are supportive of measures to increase women's representation, and highlight the often overlooked structural barriers to achieving gender parity in American elections. Rep20/20 is a project of FairVote, a non-partisan non-profit organization, thus the overall look and feel is influenced by the parent brand. I loved working on this project because one, I wholly support the organization's mission, and two, I ended up having a wealth of source material from which to pull inspiration. Motivated by the client's initial inclusion of a suffrage poster (see below) in the design brief, I dug into the suffrage movement in the US during the early 20th and even late 19th centuries and found it had been fairly well documented. During my research, I amassed a huge collection of photographs depicting everything from parades and rallies to close-ups of individual buttons, pennants, and other 'marketing material,' which I hung up around my desk to always have a close reference. The colors were to remain in the purple and yellow realms (ultimately branded as 'gold'), to provide a consistent element from the old brand to the new, helping it feel instantly familiar to those already aware of the organization. The color scheme used by the suffrage movement in the US focused on purple and gold (interestingly the UK movement favored purple and green), and the idea was to harken back to the empowerment behind that movement. I initially sampled the colors from the above suffrage poster, and tweaked them to create a vibrant, friendly, and distinctly modern scheme. After many iterations, the flag/pennant was chosen for the main logo icon, and as a visual motif across the brand identity. This shape was seen countless times in suffrage parade materials, and it also enables a great sense of forward-motion to the logo with its angle and extended shape. In the final iterations of the logo, I incorporated the flag into the 20/20, blending it into the curvature of the '2' letterform and also acting as the slash. This was also able to match the descender of the lowercase 'p' in the wordmark, allowing the tagline to fit nicely in the center. 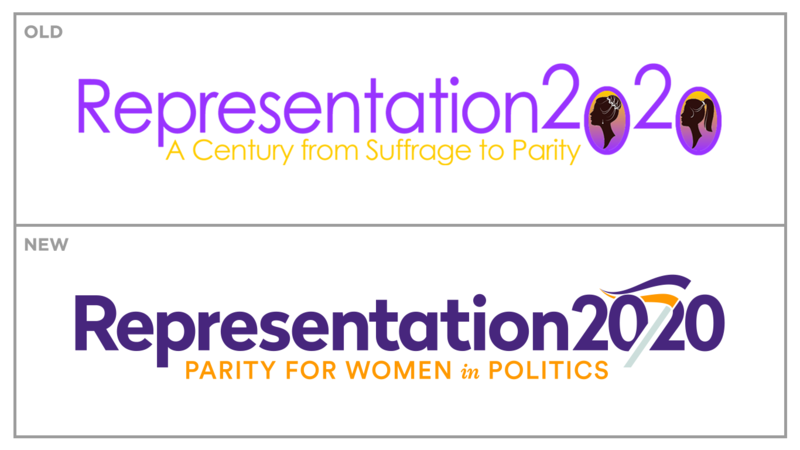 As for the wordmark, early on I knew I wanted to do a strong, modern sans serif to counter the call-back to the suffrage movement with the colors (and eventually the flag as well), intending to capture the forward-looking nature of Rep20/20 that the previous brand didn't quite evoke. For this I chose a recent favorite geometric sans-serif 'Radikal' from Nootype, which captures the bold yet friendly attitude of the organization. The tagline is set in Lineto's 'Circular,' which is much more legible at smaller sizes than Radikal, while complementing it nicely. One of the challenges with this brand was the large width required due to the name of the organization — a hefty 18 characters. I created a shorted version with "Rep20/20," as it had a more usable and practical size ratio, and was also a common nickname for the organization. However this was suggested to use sparingly, as most people wouldn't associate 'rep' with representation (leaning more towards representative, i.e. phone rep) without knowing anything else about the organization. Due to the vagueness of the organization's name without context, we emphasized that the tagline be present in usage as much as possible. Speaking of the organization’s name, one particular challenge with this project was the deciding between Representation2020 (referring to the year), and Representation20/20 (referring to perfect vision, equality and balance). When starting this project, the former was the name of the organization, but after many conversations with the client, the latter, emphasizing balance was ultimately chosen. This shift required reworking the flag from an ornamental element of the logo to an integral part of the wordmark, acting as the slash in 20/20. Ultimately, I think this change made the logo stronger, reminding me that restrictions and challenges really lead to the most creative work. I'm quite proud of the logo in all its iterations, and how it relates to the parent FairVote brand overall. After the logo and brand direction were decided on, Veracity carried the look and feel of the brand to Rep20/20’s new website. The site’s refresh captures the bold new look of the brand, allowing for a much more personal and engaged connection with the target audience. You can see the live site here.